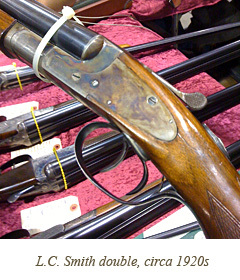 Last weekend I attended the Michigan Antique Arms Collectors show. My focus was to continue researching classic American-made, 20 gauge, side-by-side shotguns. To be clear, I have been to only a few gun shows, I am not a gun “enthusiast”, nor am I a collector, and have nothing against those who have a keen interest in guns. With that said, there is one consistent truth in the gun show world… they attract a, let’s say, eclectic blend of exhibitors and visitors. Where else can you see a heavily bearded man draped from head-to-toe in fur pelts wandering around with a musket slung over his shoulder… and we’re miles from the Yukon Trail. Survivalist gear, anti-government swag, and collectible Pickelhaubes aside, I’ve met some truly friendly and informative people at gun shows. Take for instance Jay, who runs Vintage Firearms, Inc. While hosting a crowded booth, Jay took ample time to walk this obvious newbie through a few critical details regarding what he calls the American “Big 5” (referring to Fox, Parker, L.C. Smith, Ithaca, and Lefever.) The man had an encyclopedic knowledge of these firearms. For example, he detailed how to determine the necessity of adjusting the loading lever of Parkers by checking the left-to-right position, and addressed why Fox Sterlingworths made in Philadelphia are better… the list goes on. I was impressed. With any luck, I may just find the perfect double gun to use in the grouse woods this fall.